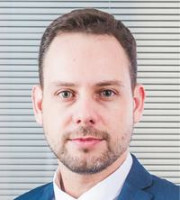 Jiuliano Maurer’s academic background includes an LLM from the University of Southern California. Mr Maurer is a member of the New York Bar Association and can practise in the state. Given his academic and work experience in the United States, Mr Maurer has acquired deep knowledge of the US legal system and the US courts’ trends in the area of intellectual property. Mr Maurer is an experienced and qualified lawyer who handles IP matters on behalf of large multinational corporations both in trademark prosecution and litigation, as well as enforcement against counterfeiting and trademark licensing agreements. Mr Maurer has been appointed to INTA’s Internet Committee (2014-2015), its Impact Studies Committee (2016-2017) and its Data Protection Committee (2018-2019). Mr Maurer was named an Intellectual Property Star by Managing Intellectual Property. He was also recognised as a leading lawyer in copyright law, media, sports and entertainment, trademark prosecution, data protection and fashion law by Leaders League. He is fluent in Portuguese and English.